What if You Could Solve Your Biggest Application Challenge in Just 30 Minutes? If you’re one of the more than 23,000 food science and technology professionals that will be at the Institute of Food Technologists’ Annual Meeting & Food Expo in Chicago in just a few weeks, we can help you do just that. Our natural whey protein products provide food and beverage manufacturers with solutions to a variety of application challenges, including fat reduction, cost reduction, protein fortification, water-holding functionality, and more. In fact, Grande Bravo® is a safe, cost-effective substitute for fresh eggs and other dairy products, while also enhancing your product’s flavor, texture, and appearance – among many other healthy benefits. 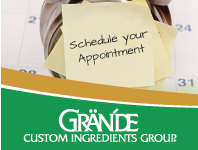 Click here or the button below to sign up for a free 30-minute consultation with a Grande Technical Sales Manager to talk about your formulation challenges. We’ll call you personally to set a specific time to chat. And don’t forget to stop by Booth #3731 to talk to our team of experts. They’ll be happy to explain how our whey protein products can help you overcome your current application challenges and improve your product’s overall healthfulness. It might just be your most valuable stop at the expo!